What do you do when you have a giant acrylic rod & some solar panels lying around. You have to find some use for it. You can't just let them sit there on the shelf. 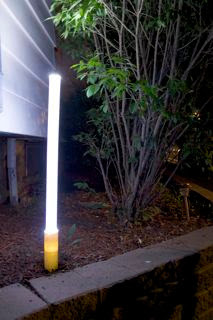 What's cooler than a 3' glowing rod in your yard. I created the solar saber for an experiment in building a solar light that was much brighter than the store bought variety. After building one I'm baffled that most of the solar lights are so dim. The construction was very simple and the end result is a bright modern patio light. 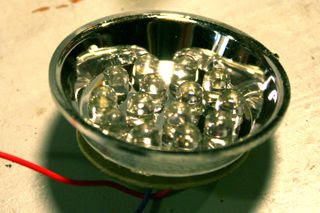 I dismantled a 14 LED head from a cheap flashlight. 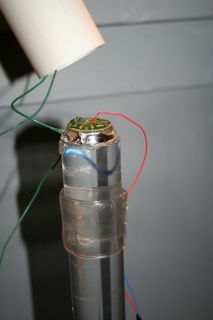 Hot glued the LED light to the bottom of the acrylic rod.The LED light used 3 AAA batteries wired in a series with no resistors to drop the incoming current so it would be very efficient to use for solar lighting. 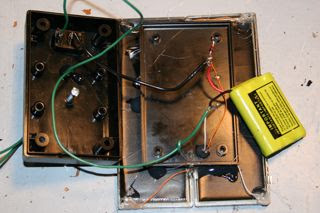 For the battery I used a cordless phone battery that was in a similar 3 AAA arrangement and voltage. 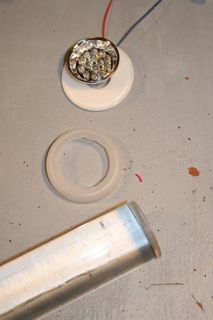 I cut some clear tubbing down the middle and wrapped and glued it around the acrylic rod so it would fit perfectly into the PVC pipe. I used the PVC pipe to hold the rod into the ground and glued the two pieces together. I wired two 5V solar panels in a series and used a 5.1V zener diode from radioshack (part #276-0565 if your interested) on the positive connection. 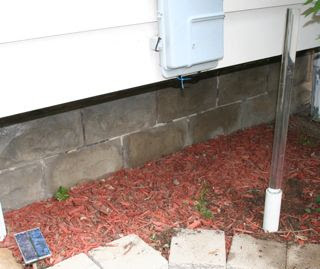 The diode prevents the battery from discharging though the solar panels at night. Instead of the light coming on automatically at night I used an on/off switch since it is only used occasionally and this would allow the battery to charge fully. I put every thing in a plastic hobby box and glued the solar panels to the top of it. 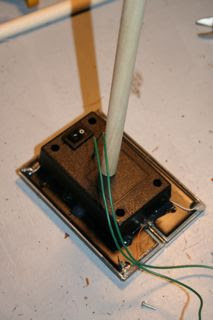 I also used a wooden dowel to hold everything on the ground. There it is with the solar panel and solar saber together. It really lights up the area at night. Plus a lot of light shoots out the top of the rod and lights up the roof line. It makes a great bug free party light. When it is fully charged it will still be on 24 hours later. Now I can tell the pizza guy it's the house with the glowing light saber in the yard. This was a fun inexpensive project that anyone can do.